The Founder of Harvey Thatch S.A Pty Ltd started out as a small business owner in 1973. He mastered the art of thatching over a period of 37 years and is well known in the industry. 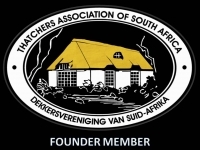 He is also a founder member of the Thatchers Association of South Africa (TASA). In 1995 he got associated with insurance claims and in 2004 the company signed a contract with OUTsurance, which is still ongoing. We have been a registered installer of harvey thatch tiles with Harvey Roofing Products since 2004. We pride ourselves in EXCELLENT workmanship and AWESOME service to our clients and we walk the extra mile for our customers with smile.